Bio vanillin is the chief component extracted from vanilla beans which is widely used as a flavoring agent in food, beverages and pharmaceuticals. Bio vanillin is preferred over synthetic vanillin as it is a healthier and safer substitute compared to synthetic vanillin. Bio vanillin has been used as a premium ingredient in medicines, personal care products and perfumes and it is expected to drive the market over the forecast period. Food regulatory authorities in the U.S. and Europe have contributed to the growth of bio vanillin market owing to the stringent rules and regulations for bio based products. Bio vanillin offers an amusing fragrance and causes minimal or no damage to human health. Wide acceptance of bio vanillin owing to its natural label over synthetic vanillin products has been the key driver of growth for the bio vanillin market. Rise in the number of food and beverage industry has fuelled the demand for bio vanillin over the forecast period. Natural or bio vanillin accounts for 2 to 3% of the global vanillin market and it is way more costly than synthetic vanillin. Chemical industries are expanding rapidly in order to substitute synthetic materials with renewable ones. Biotechnological methods are practiced for deriving bio vanillin as it causes minimal threat to the environment and causes no toxic wastes. High price of bio vanillin coupled with the supply deficit is expected to restrict the market over the years to come. However, the bio vanillin market is on the rise and in its growing stage, and is expected to create potential opportunities for the years to come. It is expected to reach US$14.34 mn by the end of 2025 from US$7.60 mn in 2016. 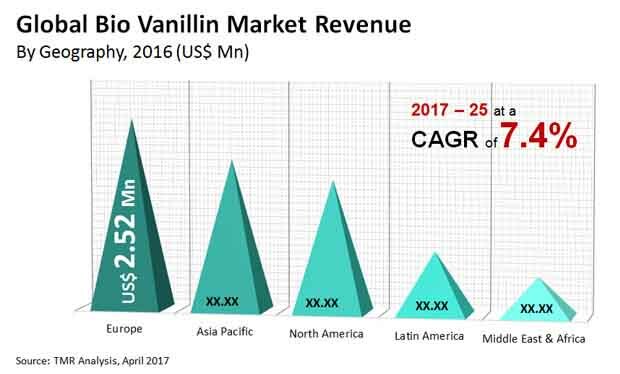 If these figures hold true, the global bio vanillin market will exhibit a CAGR of 7.4% between 2017 and 2025. The global bio vanillin market is classified in terms of application and geography. By application, the bio vanillin market has been segregated into food, beverages, pharmaceuticals, and fragrances. Food occupied for the most dominant segment constituting nearly 50.82% of the market in 2016 and it is expected to retain its position over the forecast period. Bio vanillin has majority of its application in food and beverage industry and so this application segment occupies for a dominant share of the overall bio vanillin market over the forecast period. Natural labeling of foods by the foods authorities of various regions has propelled the demand for bio vanillin in the food industry. Food application segment has been further sub-segmented into ice-cream, baked goods, chocolates and other types of food such as mayonnaise, cheese, sauces and spreads, among others. Baked goods segment accounted for a considerable market share over the forecast period owing to the wide usage of bio vanillin in breads, cakes and cookies among others. Regionally, the global bio vanillin market has been segmented into North America, Europe, Asia-Pacific, Middle East & Africa, and Latin America. In terms of revenue, Europe held the dominant share of 33.14% in the global market in 2016 and it is likely to retain its dominance over the forecast period. Regulatory guidelines for natural product have been crucial driving factors of growth for the bio vanillin market in this region. Wide popularity of bio vanillin as a premium ingredient in the food and pharmaceuticals industry also stoked sales in the Europe bio vanillin market. However, Asia-Pacific is the most attractive market for bio vanillin as it has tremendous growth potential over the years to come. Expansion of the food and beverages industry is one of the key driving factors for the growth of the bio vanillin market in Asia Pacific. The rising demand from emerging economies such as China, India and Indonesia, among others will boost the bio vanillin market over the forecast period. Asia-Pacific is likely to remain the major region in terms of volume over the forecast period. Besides this, North America has proven a lucrative market for the bio vanillin market owing to the health consciousness among consumers, coupled with the rise in the consumer preference for natural products. The key players in the bio vanillin market are Solvay SA, Givaudan SA, Firmenich SA, Apple Flavor & Fragrance Group Co., Ltd., Advanced Biotech, Evolva Holding SA, Lesaffre, Archer Daniels Midland Company, Aurochemicals and Borregaard. The report covers the analysis and forecast of the bio vanillin market on a global and regional level. The study provides historic data of 2016 along with the forecast for the period between 2017 and 2025 based on revenue (US$ Mn) and Volume (Tons). The study provides a comprehensive view of the bio vanillin market by segmenting it based on application. By application, the bio vanillin market has been segregated into food, beverages, pharmaceuticals and fragrances. Food has been further sub-segmented into ice cream, baked goods, chocolates and others. Regional segmentation includes the current and forecast demand for North America, Europe, Asia-Pacific, Middle East & Africa and Latin America. These have been further sub-segmented into countries and regions with relevance to the market. The segmentation also includes demand for individual product and applications in all regions. The competitive profiling of the key players in the global bio vanillin market across five broad geographic regions is included in the study. These include different business strategies adopted by the leading players and their recent developments as in the field of bio vanillin. A comprehensive analysis of the market dynamics that is inclusive of market drivers, restraints and opportunities is included in the purview of the report. Additionally, the report includes potential opportunities in the bio vanillin market on the global and regional level. Market dynamics are the factors which impact the market growth, thereby helping to understand the ongoing trends of the global market. Therefore, the report provides the forecast of the global market for the period from 2017 to 2025, along with offering an inclusive study of the bio vanillin market. The report provides the size of the bio vanillin market in2016 and the forecast for the next nine years up to 2025. The size of the global bio vanillin market is provided in terms of both volume and revenue. Market revenue and volume is defined in US$ Mn and Tons respectively. The market size and forecast for each application segment are provided in the context of global and regional markets. Numbers provided in this report are derived based on demand generated from different applications. Market dynamics prevalent in North America, Europe and Asia-Pacific have been taken into account for estimating the growth of the global market. Market estimates for this study have been based revenue being derived through regional pricing trends. The price for commonly utilized quality of bio vanillin in each application has been considered. Demand for bio vanillin has been derived by analyzing the global and regional demand for bio vanillin in each application for its respective functions. The global bio vanillinmarket has been analyzed based on expected demand. Average selling price of bio vanillin products in the major countries has been taken into consideration to estimate regional and global revenue. Forecasts have been based on the expected demand from bio vanillin applications. We have used the bottom-up approach to estimate the global revenue of bio vanillin market, split into regions. We have initially determined the volume and price in every region for the bio vanillin market. Revenue has been determined with the help of volume and price derived from every region. Based on application, we have summed up the individual revenues from all the regions to achieve the global revenue for bio vanillin. The application split of the market has been derived using a bottom-up approach for each regional market separately, with the global application segment split being an integration of regional estimates. Companies were considered for the market share analysis based on their product portfolio, revenue, and manufacturing capacity. In the absence of specific data related to the sales of bio vanillin of several privately held companies, calculated assumptions have been made in view of the company’s product portfolio and regional presence along with the demand for products in its portfolio. The report covers a detailed competitive outlook that includes market share and company profiles of key players operating in the global market. The key players in the bio vanillin market are Solvay SA, GivaudanSA, Firmenich SA, Apple Flavor & Fragrance Group Co., Ltd., Advanced Biotech, Evolva Holding SA, Lesaffre, Archer Daniels Midland Company, Aurochemicals and Borregaard..